The 21 turbines at the Kingdom Community Wind farm in Vermont soar above Lowell Mountain, a testament in steel and fiberglass to the state’s growing use of green energy. Except when they aren’t allowed to spin at their fastest. That has been the case several times in the farm’s short existence, including during the record July heat wave when it could have produced enough much-needed energy to fuel a small town. Instead, the grid system operator held it at times to just one-third of what it could have produced. It is not the first time the grid system operator, ISO New England, which operates in six states, has cut back energy from the farm since it began operating at the end of last year, or from others in the region, including some in Maine and New Hampshire. Other windy states and regions like Texas and the Midwest have experienced similar cutbacks, known as curtailments. But the recent Vermont episode, which set off a debate among government officials, the New England grid executives and the wind farm producers, highlights a broader struggle taking place across the country as utilities increasingly turn to renewable sources of energy. Because energy produced by wind, for example, is intermittent, its generating capacity is harder to predict than conventional power’s. And a lack of widely available, cost-effective ways to store electricity generated by wind only compounds the complex current marketplace. Moreover, although the wind industry has been growing for decades, it is still relatively new at operating large-scale wind farms, so it is often only once a farm is up and running that some of the problems emerge, developers say. And those problems are likely to grow. Last year, wind power was the most prevalent source of new energy capacity – 43 percent of overall generation installed – while its price neared an all-time low, according to a recent report for the Department of Energy by Lawrence Berkeley National Laboratory. A number of factors can trigger curtailments in wind output, including reducing the danger to bats or birds flying around the spinning blades. But more commonly, regional grid managers, who must match demand and supply instantaneously, call for a reduction in wind power when more energy is produced than the system can safely transport, they say. The fear, she said, is that a surge in energy could overload and shut down the wires, leading to a drop in voltage on the system that could spread blackouts through the region and to other parts of the country. For the wind farm developers and operators, though, the curtailments can affect their bottom lines. David Hallquist, chief executive of Vermont Electric Cooperative, which co-owns Kingdom Community Wind, has estimated that the curtailments cost the farm more than $1.5 million last winter. In New Hampshire, ISO New England allowed only about half of the potential power from the Granite Reliable Power wind farm into its system last year, leading the farm’s owner to temporarily withhold some of the payments it was supposed to make to Coos County, where it operates. David Blittersdorf, chief executive of AllEarth Renewables, which developed Georgia Mountain Community Wind in Vermont, said that at full operating capacity he can lose $1,000 an hour if the electricity is not sold. Cutting wind output can also interfere with the ability of utilities to meet state goals and mandates to include a certain percentage of renewable energy in the mix of power generated. 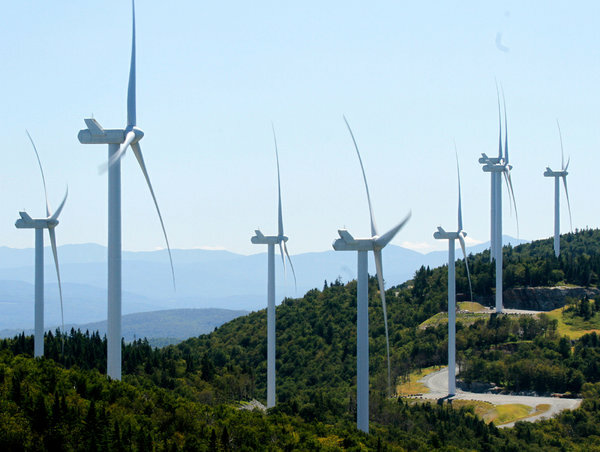 In Vermont, the July wind curtailment caught the attention of Gov. Peter Shumlin, who wrote to ISO New England, questioning whether it was doing all it could to integrate and use renewable energy. ISO New England officials said they were able to put renewable energy from other sources into the system during the heat wave, but would not say whether that matched or exceeded the amount of power withheld from Kingdom Community Wind, citing confidentiality restrictions. At the heart of the dispute between Green Mountain Power and the system operator is what one Vermont official called “an honest disagreement” over what is needed to safely connect to the grid and manage the energy output from the farm. The utility questioned and fought several of the grid operator’s assumptions and requirements – which it says did not surface until late in a multiyear planning process – but ultimately federal regulators agreed that ISO New England had the right to impose its plan. Eager to qualify for a generous federal tax credit that was expiring at the end of last year, Green Mountain pushed ahead to get the wind farm going while it worked out how it would comply with the requirements. It has now settled on installing a $10 million piece of equipment that should help even out the flow of energy and reduce the cutbacks, Ms. Powell said, although grid officials have given her no assurances. In a response to Governor Shumlin last week, Gordon van Welie, ISO New England’s chief executive, wrote that Green Mountain has known “that even after the required upgrades were completed, the output of K.C.W. may still be subject to curtailment because of the project’s location and interconnection point.” But Stephen J. Rourke, vice president for system planning at ISO New England, said in an interview that he expected the upgrade, to be completed by November, to eliminate most of the curtailments.